Today started with another early wake-up call, 5.00. After coffee and muffins we set off in the dark with Dinah again as our guide. 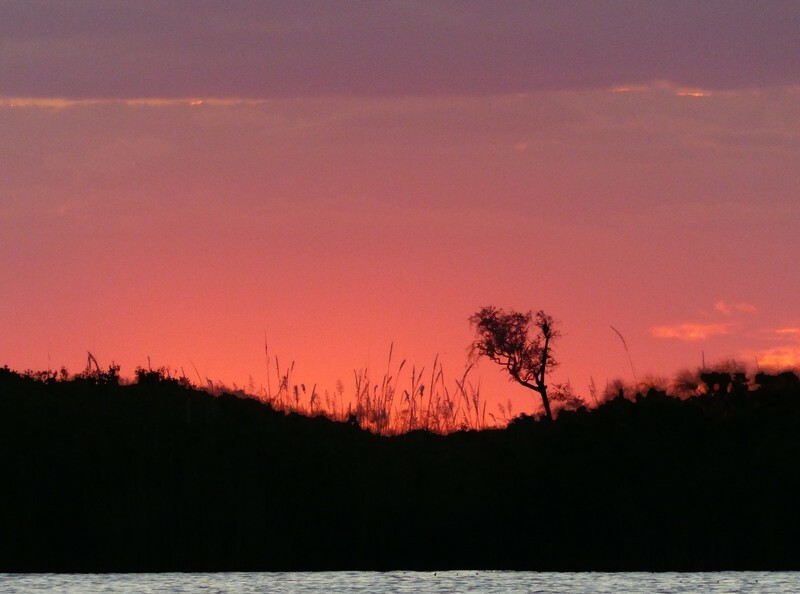 As it started to get light we were treated to a truly beautiful sunrise, the pink and orange shades of the sky reflected in the waters of the Chobe River. 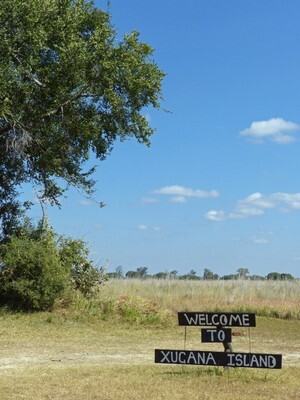 At first animal sightings were few, apart from the inevitable ubiquitous impala. We did see a couple of red-billed francolin, also known as the red-billed spurfowl. 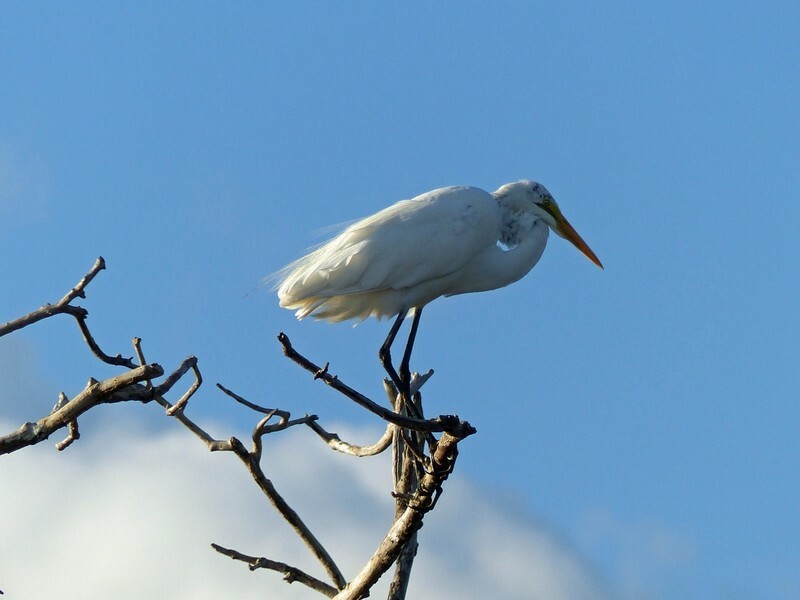 Dinah said that these are relatively rare birds here, although they seem to be generally quite common, from what I’ve read. Unfortunately the light was still too dim for decent photos. 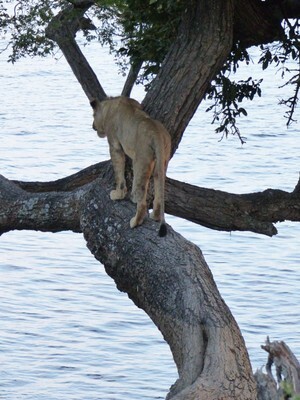 Then as we headed back to the water’s edge, Chris spotted something - a solitary young male lion in a dead tree. 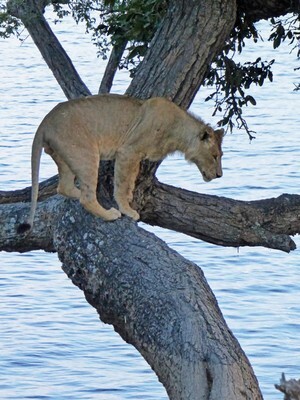 Lions only occasionally climb trees, usually when they want to stretch, so he could possibly have been doing his early morning exercises! 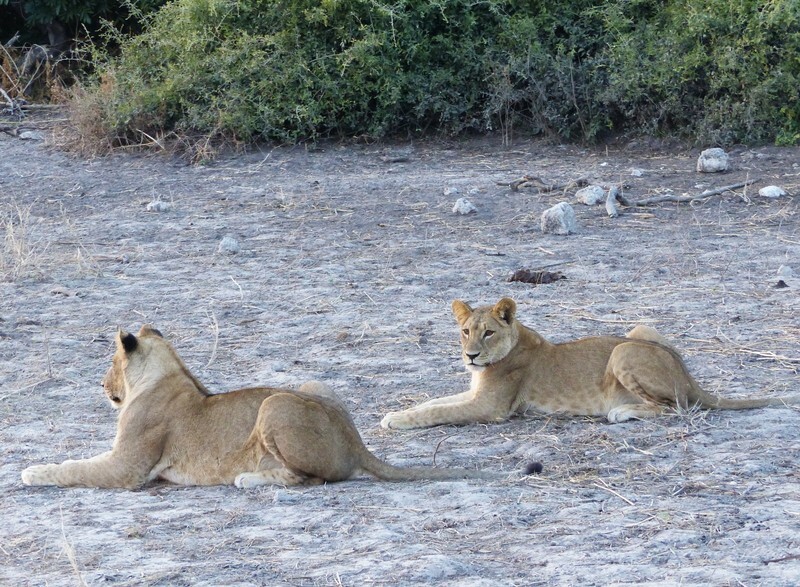 Driving on we passed a private car and the driver told us of two more young lions they had seen down on the river bank. When we reached the spot they were still there, and we were the first vehicle to reach them, so we had a perfect angle for our photos - although stubbornly they refused to turn our way apart from in brief glances. Refusing to look at us! Of course, lots more vehicles did start to arrive, and having had such a good look at the pair we decided to move on and let others take their turn. 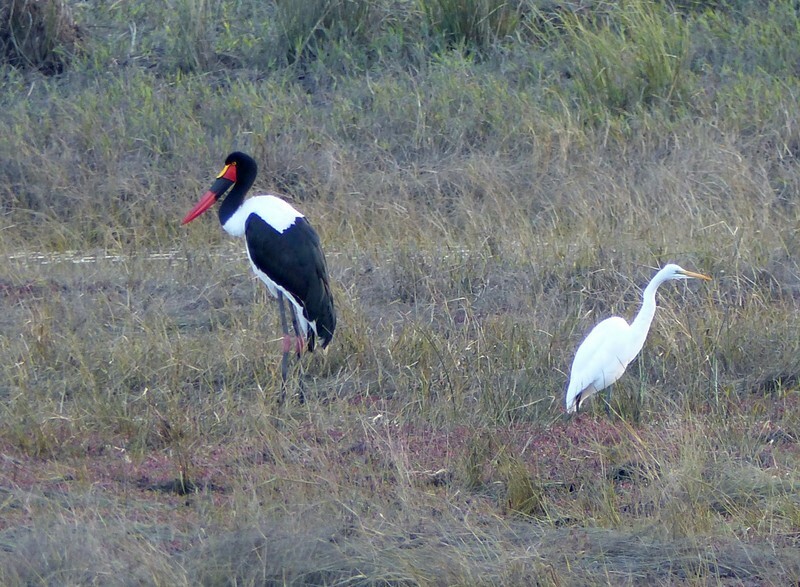 Our next significant sighting was of a Saddle-billed Stork, among a group of other birds by the water’s edge. A little further along we found a Marabou Stork in a tree, and nearby two others on the ground. On our way back to the lodge we passed the giraffe carcass we had seen a couple if evenings before. 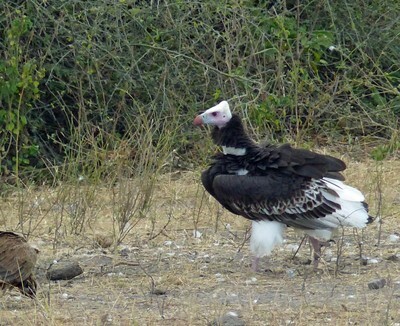 There was relatively little left of it, but some vultures were still picking over what remained, including a White-headed Vulture among the more common Cape and White-backed ones we had seen previously. By now we really needed to hurry back if we were to fit in breakfast before our departure, but it would have been a shame not to stop for the herd of sable near the lodge, as the others on this drive hadn’t yet seen these, and we hadn’t had so close a look previously. Back at the lodge there was time for breakfast before being driven to the airport at Kasane, which took about 45 minutes. 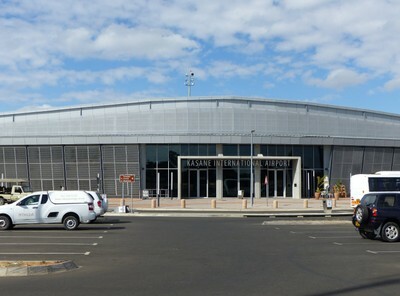 The airport surprised us by being more than just an airstrip and looked quite modern, but naturally very small scale with just a few check-in desks and no queue at all at the minimal security. There was just time in the departure area for me to check out the shop and buy a scarf (pale blue with zebra on it) - something I would be grateful for very shortly! 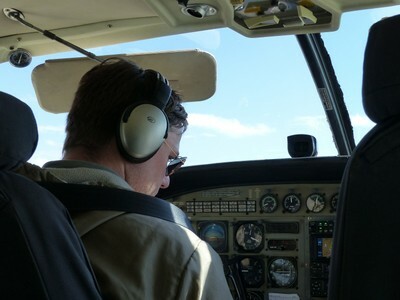 We were then escorted across the tarmac, along with six other passengers, to the small plane and its pilot. We were asked to check that our bags were in the small pile waiting to be loaded (they were) before boarding and taking a seat. Hand luggage had to be left at the back but I kept my camera with me and managed to secure a window seat at the front, as did Chris further back. Then we were off! 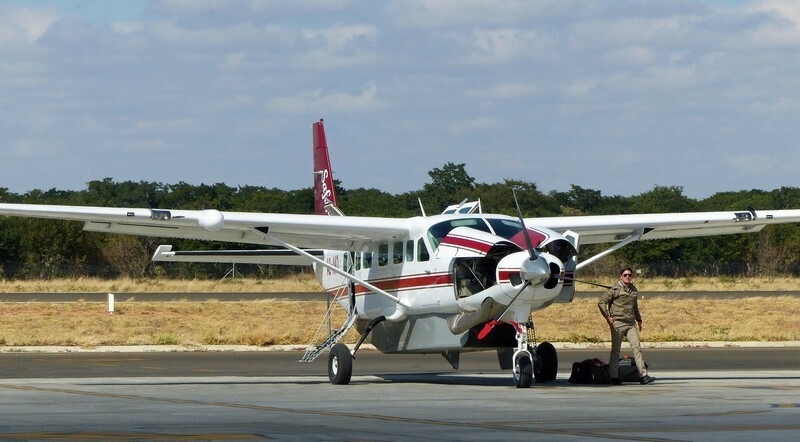 The small planes that serve the various Okavango camps operate much like buses, dropping off and picking up passengers along the way. 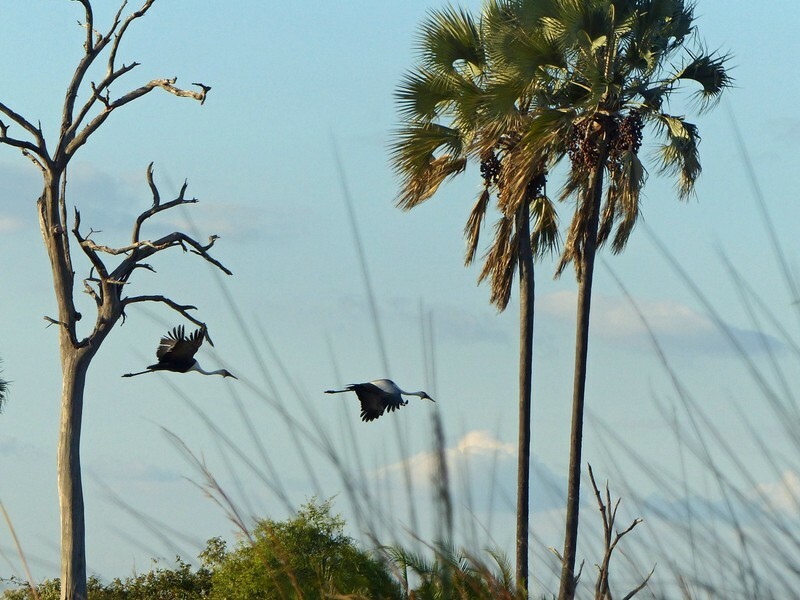 We had two scheduled stops before ours, the first after 55 minutes flying time at Camp Moremi, and the second at Camp Okavango, only a short hop from Xugana Island where we were to stay. Our journey would take about 80 minutes in total, allowing for these stops. 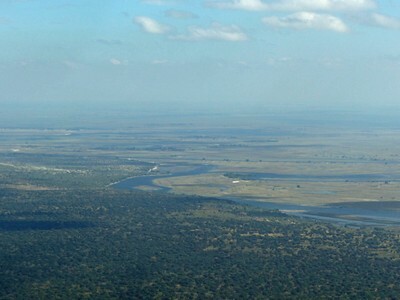 We took off and as we rose I could see the Chobe River in the distance below. 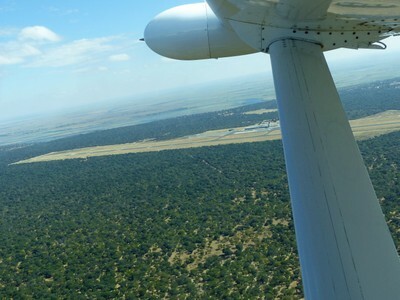 Flying south over the bush I spotted elephants at some of the water holes, looking tiny from this height. 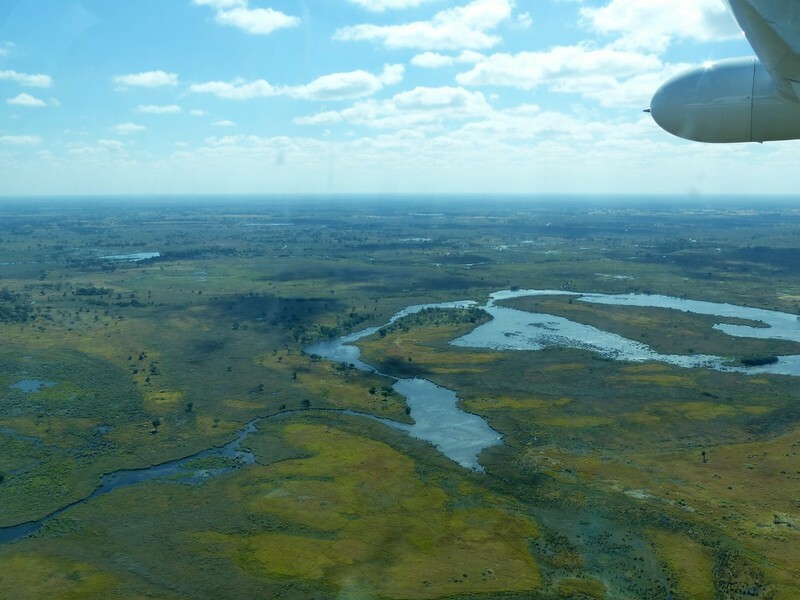 I shot some bits of video during the flight, trying to capture how the landscape below changed as we moved from bush to delta, and also one of the landings we made, at Camp Moremi. 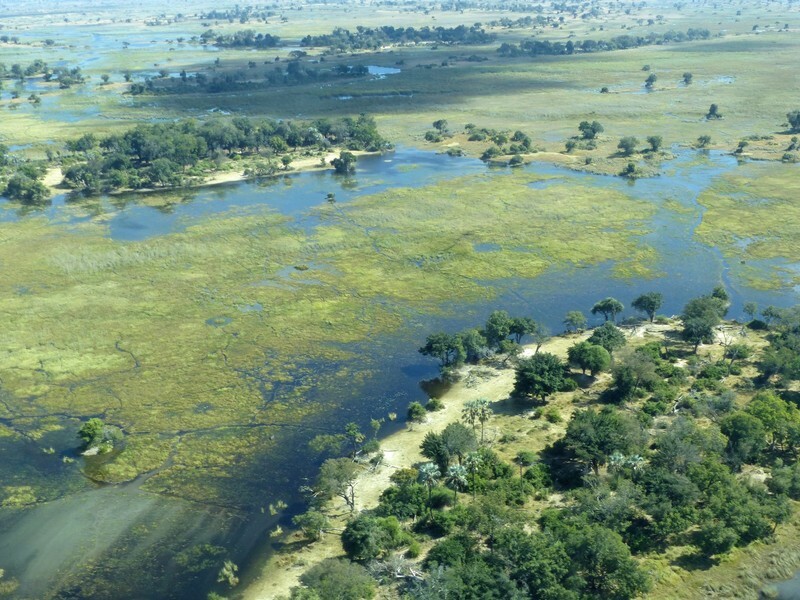 The contrast between the dryness of Chobe and the green lushness of the Okavango Delta region was very apparent. 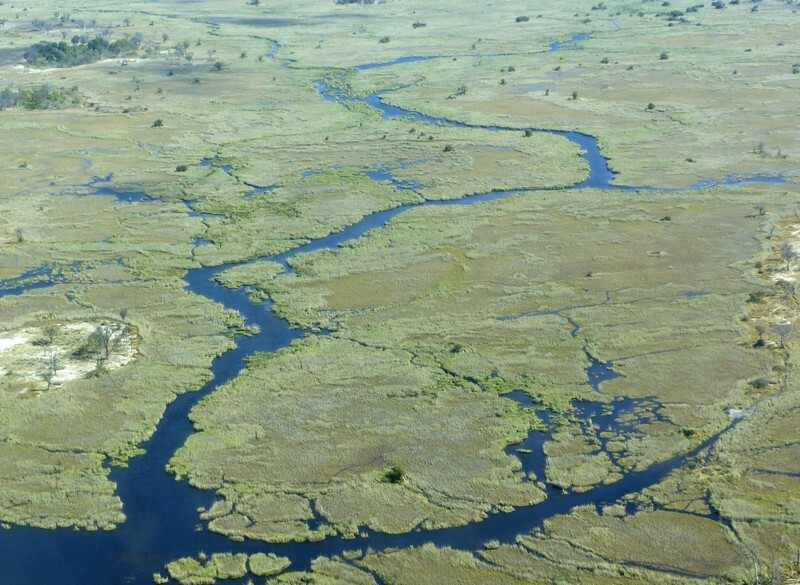 The Okavango Delta is a unique landscape and eco-system, formed by the Okavango River which flows from Angola into the Kalahari Dessert, where it disperses across a wide flood plain, creating a myriad of channels. 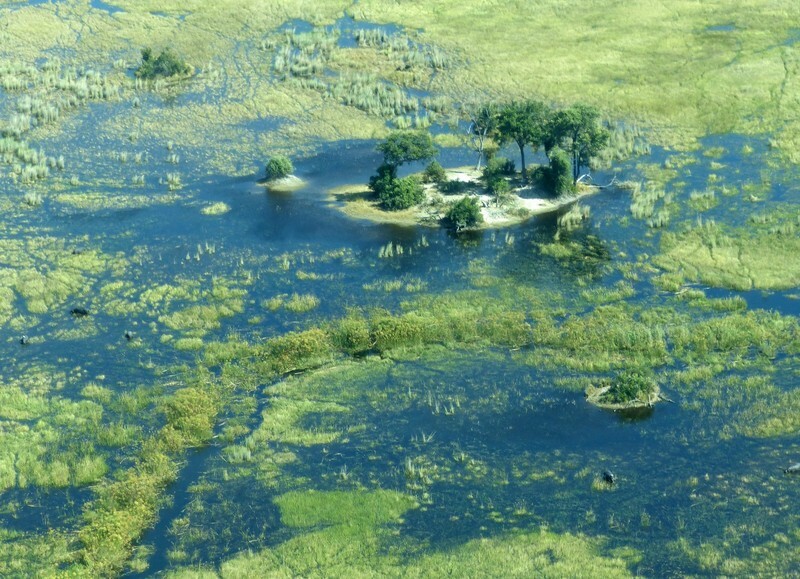 These are interspersed with small islands, created by vegetation gathering around termite mounds. 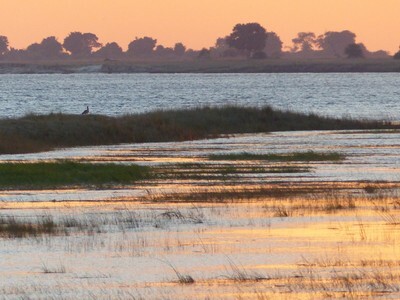 The channels are kept open by hippopotami and other animals, and lined with papyrus, creating a fascinating pattern of vivid greens and blues when seen from above like this – and a wonderful haven of wildlife to explore. 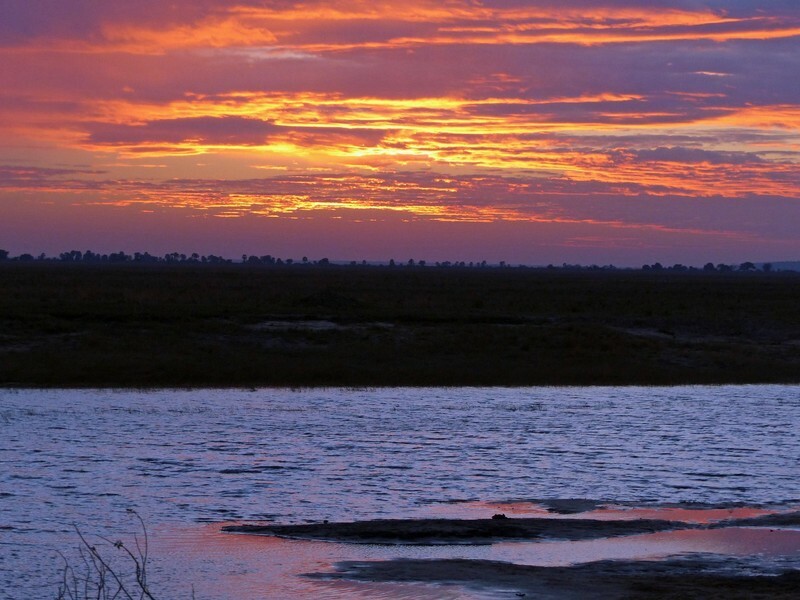 In the dry season of winter, when we visited (July), the delta is like a massive oasis, as surprisingly that is when it is at its fullest; the rains that fall in Angola in the early part of the year arrive here in the winter months when the rest of the Kalahari is at its driest. Xugana Island Lodge was to be our base for the next three nights. 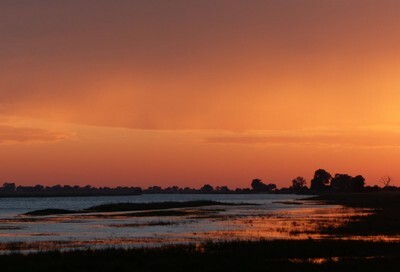 It is located on a small island towards the northern edge of the delta, in a lagoon said to be one of the most beautiful of them all – or as the website says, ‘the most spectacular permanent water site in the entire Okavango Delta, which itself is Africa’s largest and most awe-inspiring oasis’. Having not seen all the others I am unable to judge, but spectacularly beautiful it certainly was! The lodge has just eight rooms and takes a maximum of 16 guests at a time, though there were never more than 12 when we were there, creating a very friendly, homely atmosphere. 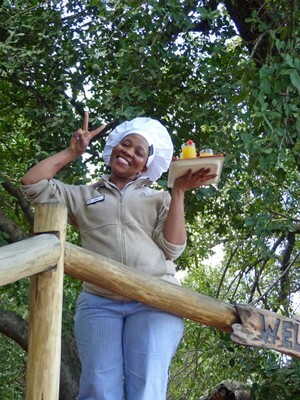 Guests, guides, staff and management all eat together, reinforcing this sense of home. 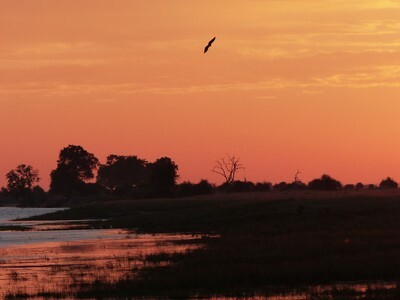 As at Chobe Game Lodge (although in other respects very different from it), stays here are fully inclusive of all meals, drinks, activities and even laundry – the latter a necessity when you have to pack so lightly for the flights! 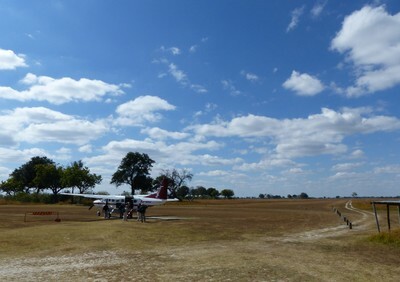 The airstrip for the lodge seemed dry and totally remote, but only a few steps away was the water channel and a motor boat waiting to take us, and the other couple who alighted here, to the lodge. 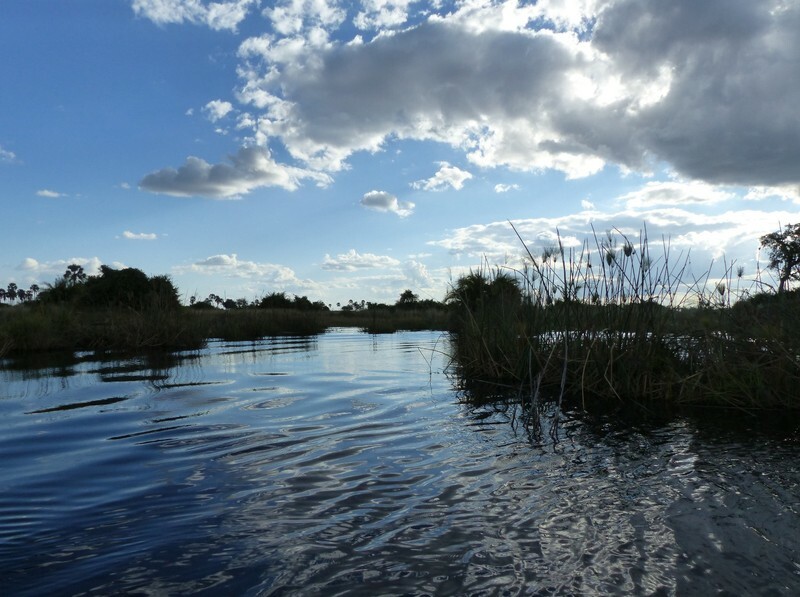 The ride took about 15 minutes, along a channel fringed with papyrus which stood high above us, and out on to the lagoon. 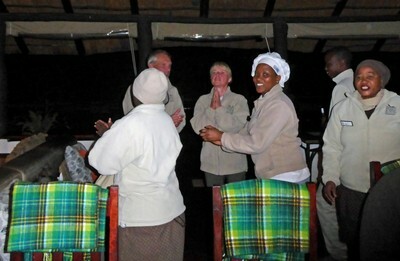 We were greeted at the jetty of the lodge by a welcoming committee of the staff, who sang, danced a little and greeted us with hot towels and cold drinks. We were given a briefing about the schedule of activities, meal times etc., then shown to our rooms. 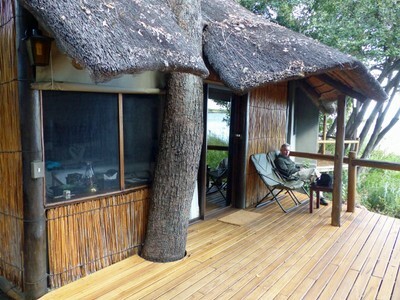 We had room 4, which like all of them was built of reeds and thatch, and had a view of the lagoon from the deck - and from the shower! 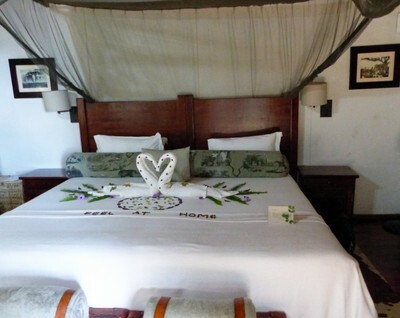 It was lovely in a rustic fashion, and the bed beautifully decorated with petals, towels folded to look like swans and more. But it has to be said that it was not very warm. The rooms are screened at the windows but not glazed, and the chilly wind found its way inside all too easily. We were clearly in for a cold few days. I had known of course that temperatures drop here at night, but had expected warmer days, and had also thought that staying in hotels, rather than camping, would mean that we didn’t need as many warm clothes. Clearly I had thought wrongly! So one of my first actions here was to buy a fleece from the small lodge shop, which I would wear almost constantly for the next three days! We had already missed brunch, which is served here after the morning activities, but they thoughtfully laid on a lunch for the new arrivals. 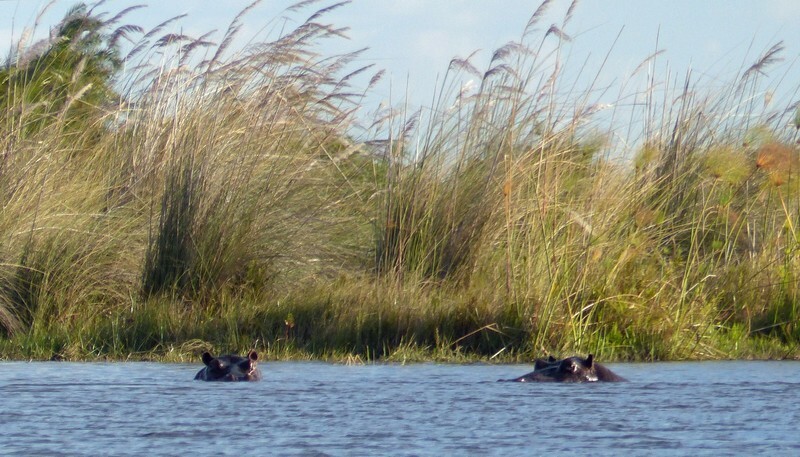 We then had time to relax and settle in before meeting up with our guide, Slade, for our first Xugana activity, which was to be a motor boat ride to another lagoon where hippos are often to be seen. As well as ourselves, and Donna and Steve from England who had arrived with us on our flight, we were joined by Glen and Arity from Australia. The six of us were to be Slade’s group for the duration of our stay. He gave a short safety briefing, and also showed us a map of the area, indicating which route we would take today. Then we were off, crossing the lagoon to enter one of the small channels that led off it. Slade navigated his way through what seemed to me to be a real maze of channels, spotting various wildlife along the way. 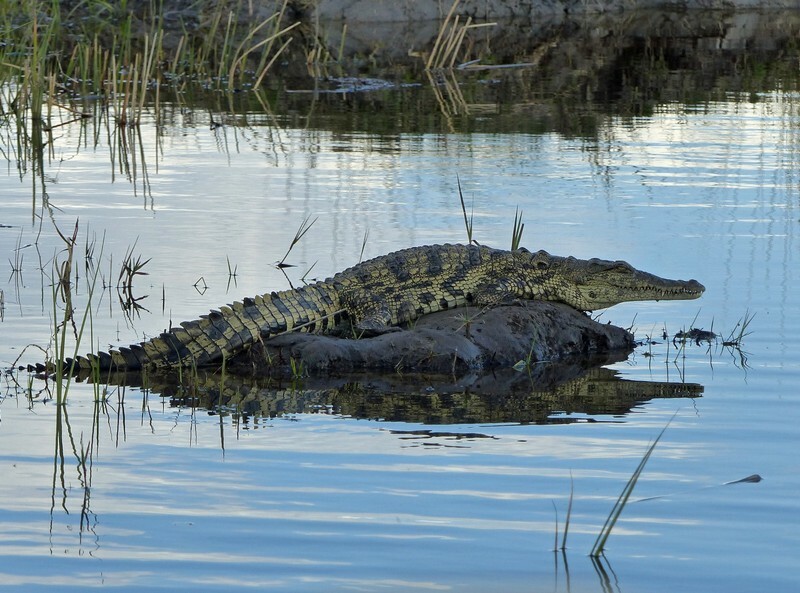 We saw several Nile crocodiles, large and small. 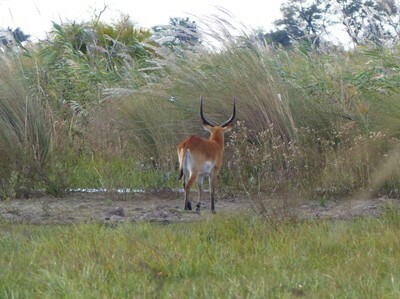 On one of the small islands he pointed out a small herd of Red Lechwe, deer that live in the delta. They were a little hard to photograph among the long grasses but I got a couple of (not very good) shots - I was to do much better later in our stay. 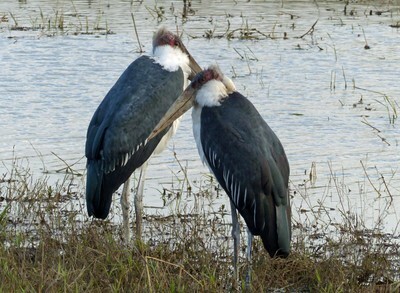 The bird life here is very different from that of Chobe, although a few of the many species we saw were the same. 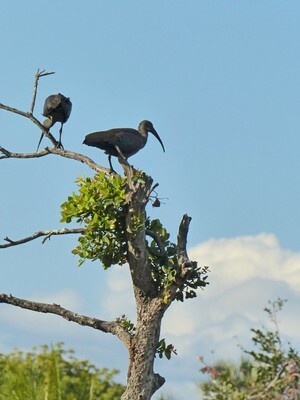 New ones included this pair of Hadeda Ibis, and several others of the same species. 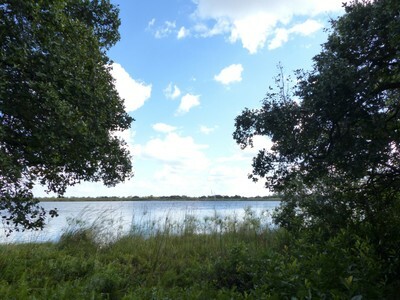 We came to the hippo lagoon, called Jerejere, and there were certainly plenty there, although we had been spoiled a bit by our encounters with them in Chobe. Here we couldn’t safely get as close, and also the water was deeper, so my photos were less successful. It was fun to see them however. 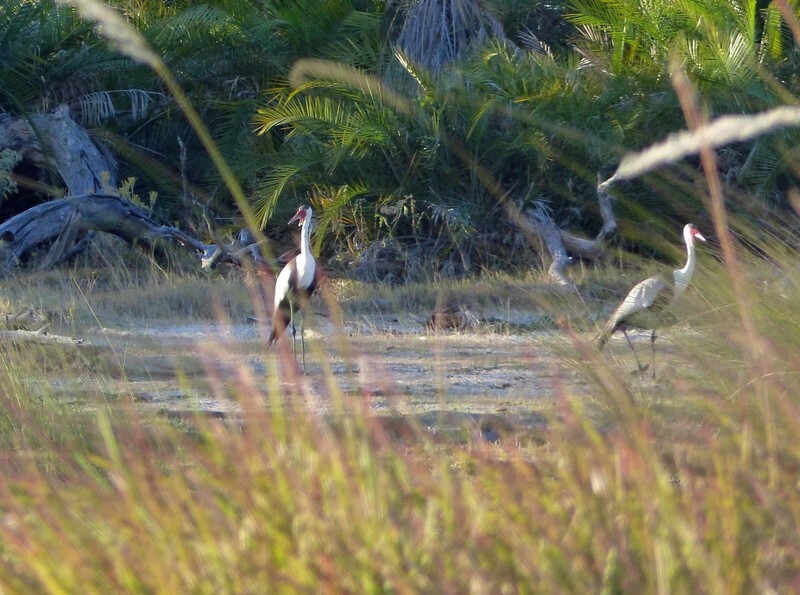 As we started to head back we saw plenty more birds, including a Fish Eagle, some Hooded Vultures, Egrets (both Great and Little), and some impressively large Wattled Cranes, their wingspans over a metre. Slade moored the boat in a strategic point from which to watch the sunset and served the drinks we had pre-ordered (wine, beer, G&T) along with some snacks. 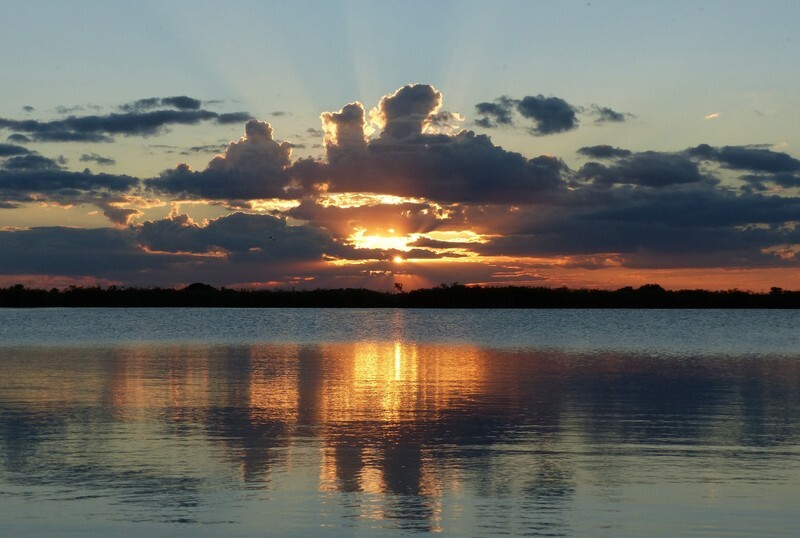 The sun put on a great show for us, which was reflected in the waters of the lagoon. Once we’d finished our drinks we headed back to the lodge. Without the sun to provide some warmth it was very chilly out on the water, and only a little warmer in our room! I didn’t bother changing for dinner, given that a) I was going to put my new fleece back on top of whatever I wore, and b) it was so dark no one would see what I wore! There were pre-dinner drinks around the campfire for those who wanted them, and dinner served in the main lodge building which nevertheless is open on one side to the elements. We ate at communal tables, sharing our meal with the guides and other staff. The starter was mushrooms in a cheese sauce, very tasty. We then had a choice of pork chop or kudu - I chose the latter which was very good, as was the cauliflower cheese and sweet potato mash that accompanied it. We were offered a choice of two red and two white wines, and everything was introduced by the chef and waiting staff. Dessert was date pudding and there was also cheese and biscuits for those who could manage them - I didn’t! 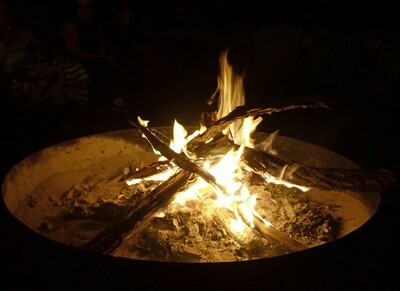 We sat out by the campfire for a short while afterwards, enjoying the relative warmth and also the bright stars overhead. With no light pollution here we could see the Milky Way really clearly. But soon we knew we had to brave the chill of our room. 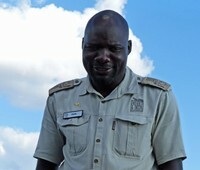 After dark all guests here are escorted to and from their rooms by a guide or other staff member (because of the risk of hippos), so we asked Clifford, one of the management team, to walk us back. It was so cold that I had to wrap a blanket around my shoulders to write up my notes for this blog, but we had been given hot-water bottles as we left the main area which we had tucked into the bed to warm it. With those and the blankets we piled on top, the bed was actually very cosy and I fell asleep to the noise of the insects outside. Hard to believe Sarah but, on reading, each day just gets better and better. I think I could die happy if I had experienced all that. Very surprised by the fact it was cold during the day and wonder how you coped with the extra weight of the fleece on your return trip?? (I always wear layers - with big pockets in some - when traveling light.) I can never understand, when everything will be on the same aircraft, why luggage is weighed but not passengers. Once again, the photographs are stunning and your writing brings the whole experience alive. Thanks so much for sharing. This sounds like the trip of a lifetime. The shots from the plane were amazing. Most of the lions we saw were in trees so maybe in the area you were in they didn't climb trees much but we saw a lot of them there. Others that we saw were on rocks - not very many were just lying on the grass. 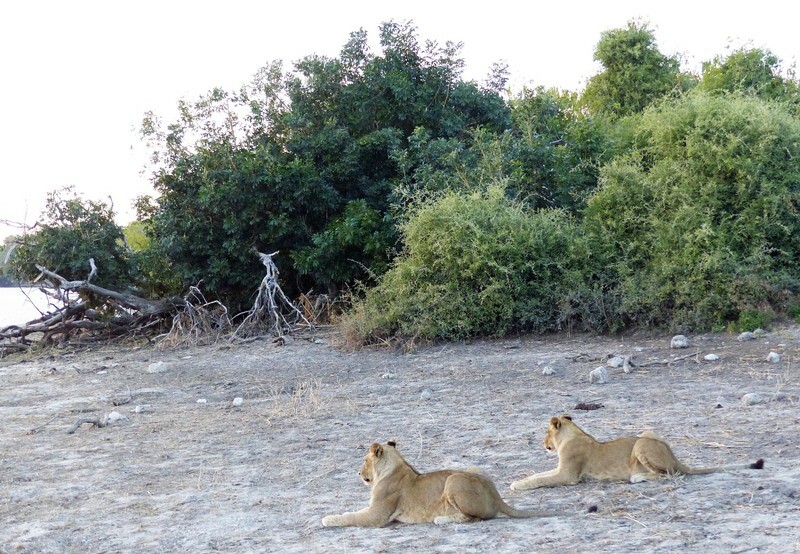 They told us that the lions don't like to spend the night in the grass because the dew gathers and gets their fur wet. We also were quite cold in the lodge near Kilimanjaro which was at higher altitude. I was surprised that it was not hot and even out in the Serengeti it was quite chilly in the morning and evening. I had a jacket and I also wore a shirt treated with repellent over my t-shirt and that was usually enough. It rarely got warm enough for me to take off the top shirt although I usually take off my jacket about lunch time. I usually wear all the bulky clothes so I don't have to pack them. 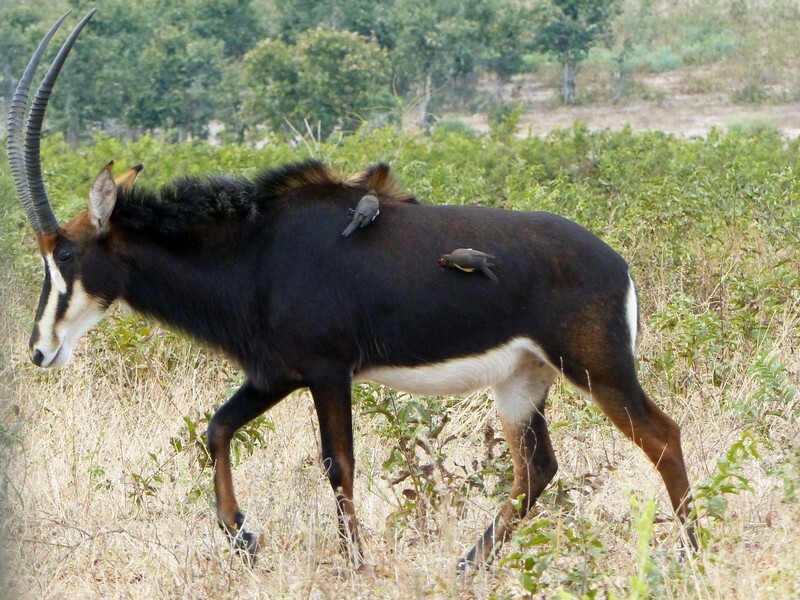 They certainly seem to have adapted to being surrounded by vehicles full of human beings! Another impressive collection of photos! I agree with others -- seems like the trip of a lifetime! But, you've already been to so many amazing places in this world so all your trips have been amazing! 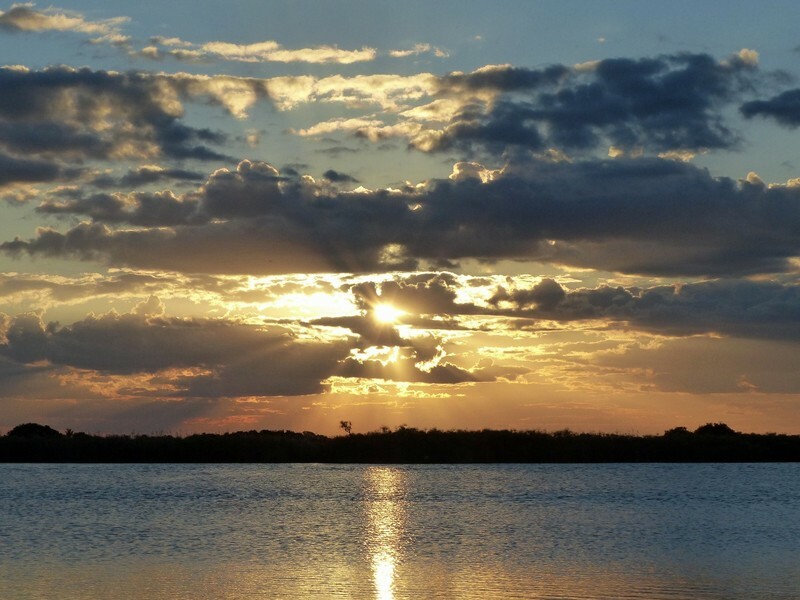 Your photos have been truly wonderful! Thank you Sylvia - it was certainly up there with the best of our trips!! 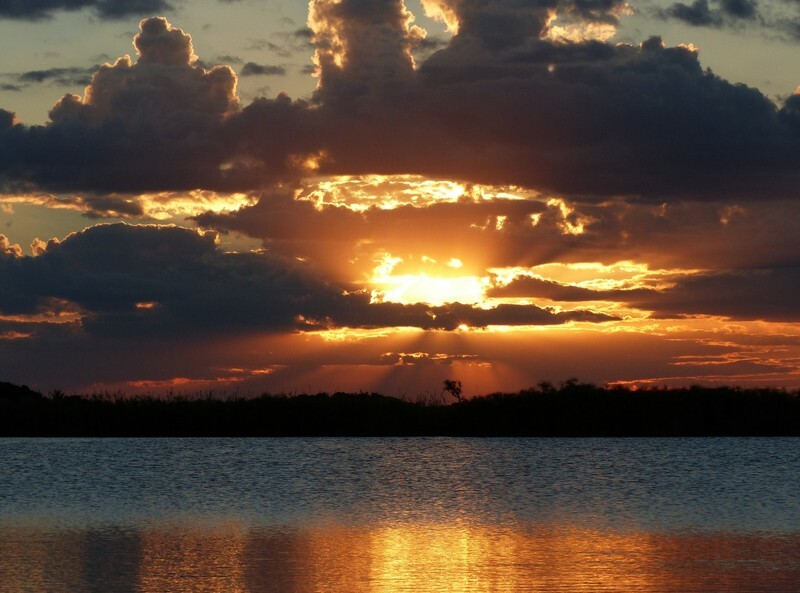 Beautiful sunrise! 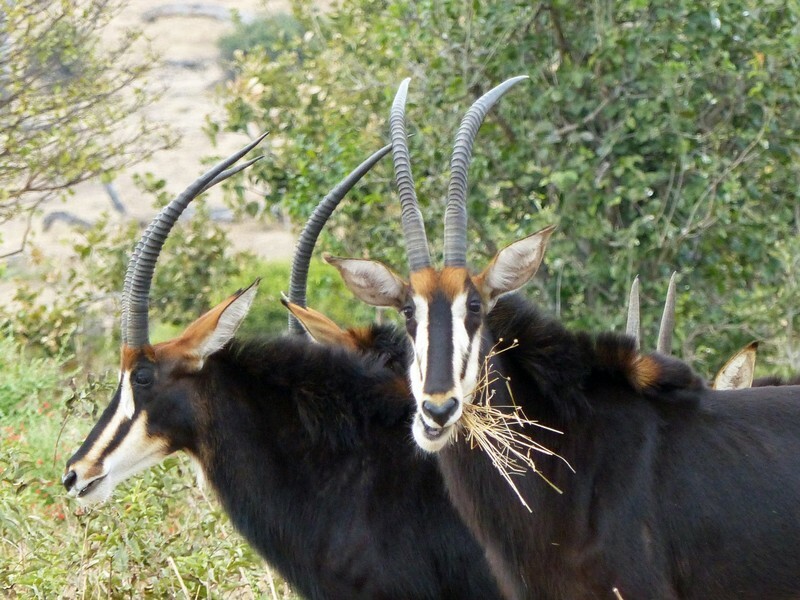 Lots of fabulous sightings, including the saddle bill, white headed vulture and sable! More envy! hehe Love the video too. Thanks Grete One of the guys in our group got very excited when we first saw the sable and Chris couldn't understand why - he thought at first he'd spotted a leopard!